Ari is a notoriously picky eater. I’ve been at my wits end trying to get him to eat anything other than peanut butter and honey sandwiches. Even though the peanut butter, honey are organic, and the bread is whole grain, it’s still not enough to survive on. There was one day, in particular, that really freaked me out. We went to Blue Sky for a muffin and coffee for me, and a chocolate chip cookie for him. He refused the cookie, which was really bizarre because he ordinarily loves those cookies. He insisted that it was “gross” and wouldn’t eat it. Desperate for a solution, I took him to my acupuncture clinic to see if they had any suggestions for holistic care to treat his eating issues. The clinic has a pediatric shift, and the practitioners were really patient and understanding. The supervisor, Melanie, recommended making a soup, and putting beef bones in it for extra nutritional value. Beef marrow bones, she said, all kinds of nutrients in them that Ari is currently not eating from his peanut butter diet. I wish I could be more scientific about this, but I’m too lazy to point you to a statistic or a source. I’m sure you can find one if you really want to. 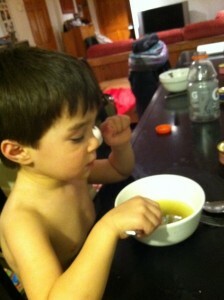 I know Ari likes chicken soup. Well, he’ll eat the chicken and the broth, for sure. 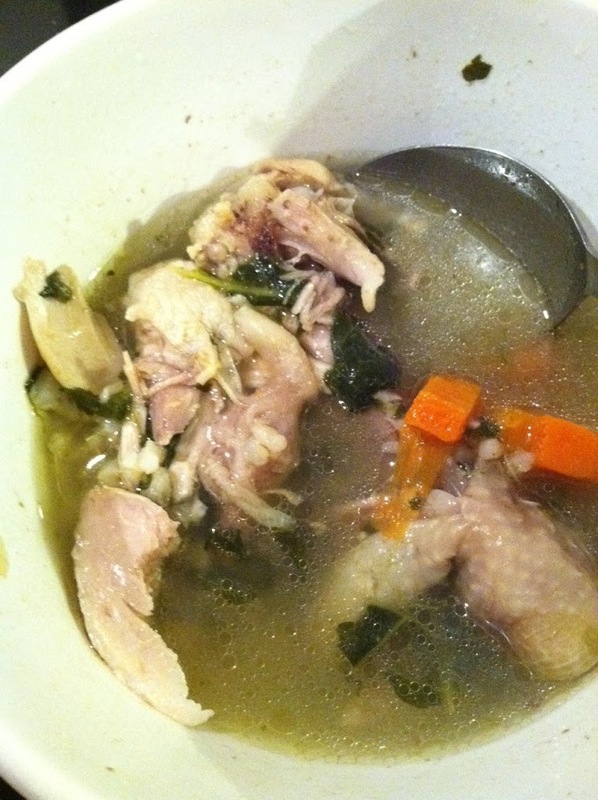 So I made chicken soup with Kosher chicken drumsticks, organic kale, organic carrots, organic short grain brown rice, organic garlic, sea salt, and lastly, I stuck Kosher beef bones in it. It came out delicious, and had a ton of vitamins and nutrients it it! It was great for me, as well, because I’m still getting over a nasty stomach virus. Ari ate up the broth (even though it was neon green) voraciously! And I was glad for that, because I knew he was getting so many essential nutrients from it. I’ve actually started feeding therapy with him. I’ll keep you posted on how that’s going as well. Happy New Year everyone! Hope you’re having a great 2012 so far! Tell me, is your child a picky eater? What steps have you taken to get him/her to eat? How about you? Were you a picky eater as a child? Are you still a picky eater as an adult? **Update- Some of you have requested the recipe for the soup, here it is! 1. Fill large soup pot 3/4 of the way with cold water. 2. Place pot of water on the stove to boil. 3. While waiting for the water to boil, chop up the remainder of the ingredients (with the exception of the rice) one by one and throw into the pot. 4. Boil the soup for an hour – 1 1/2 hours.